1) I recommend Juliana's blog post: Let's Play a Game. I loved how Juliana tried to interact with her readers. She wanted her readers to learn about her and her blog. What a great way to get readers to check out your blog! @wmchamberlain @mrsvilas I'm trying to help students create interactive presentations, and she just did that with a blog. Very cool. 2) I enjoyed reading Isbelle's post: Go to the Road Less Traveled! What an interesting how-to-essay about becoming a superhero. Great sophisticated writing for a 4th grade student! I love your use of voice. I can imagine you speaking to me and your personality coming through. You put quite a bit of time into creating an amazing blog! My students enjoy reading blog posts written by kids their age. Which student blog post do you recommend and why? These are all so thoughtful and informative, and clearly a labor of love for everyone. As a "non-blogger", I found them amazing. 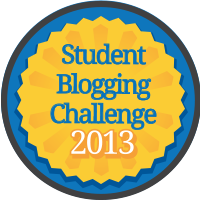 And I learned a lot, about the students, but also about blogging. If I ever do start to blog, I'm going to need someone to help me set up my GLOG!! Keep it up.